Media reports are quoting unnamed Israeli officials as saying that a few months ago, the US and Israel formed a joint working group centered on plotting against Iran. The focus of the group is fueling internal unrest against Iran. While US officials are unwilling to comment on the matter, the Israelis say the plot isn’t explicitly centered on trying to impose regime change. This is noteworthy, as both US and Israeli officials have been agitating for regime change for awhile. Instead, it appears that the focus has been on sparking public protests against Iran’s Rouhani government., This puts the public protests going on inside Iran in a whole different light, and the revelation will likely hurt the protesters’ credibility. It also doubtless weakens the US attempts to use the protests to try to sell the international community on supporting new US sanctions against Iran. This report will convince many that the protests are just dirty tricks from the US and Israel. Its an interesting game; the Zionists don’t want Iran to change, not really, so discrediting genuine indigenous movements towards better governance would be a priority. Hijacking Iranian reformers entirely in a colour revolution seems unlikely, so the next best goal is to discredit as many genuine movements as possible before they can do any good. Change in Iran is inevitable; even in societies with stronger democratic illusions, the public face of governing elites seldom last more then 20 years. Its only a matter of who gets to be in charge of the outcome. Low lifes were common in the US; the difference is an increase in US power. But the US has been trying to interfere in other countries much longer than 76 years. I’m right there with you, Richard. Problem is, “that filthy, deceptive nest of evil schemers” existed long before you or I were ever born. My dad (WWII, D-day, all of that) said, “Don’t join the US military.” I didn’t, became a SPED teacher instead. I, too, don’t know what to make of the present situation. Can Iran then make a big deal about US interference/meddling? OMG American-Israeli collusion! Alert the media! And if it goes bad we can always blame the Russians- brilliant! What I would like to know is of what benefit is all this aggression in the Middle East do for the vast majority of Americans, the answer is very little. It only benefits the elites,military industrial complex and Israel. Most Americans must be totally brainwashed to spend blood and treasure on war’s of choice in an area that had very few enemies up until the middle of the last century. Our politics have certainly created a monster of our own making. There. That’s better…. I knew something wasn’t quite right! 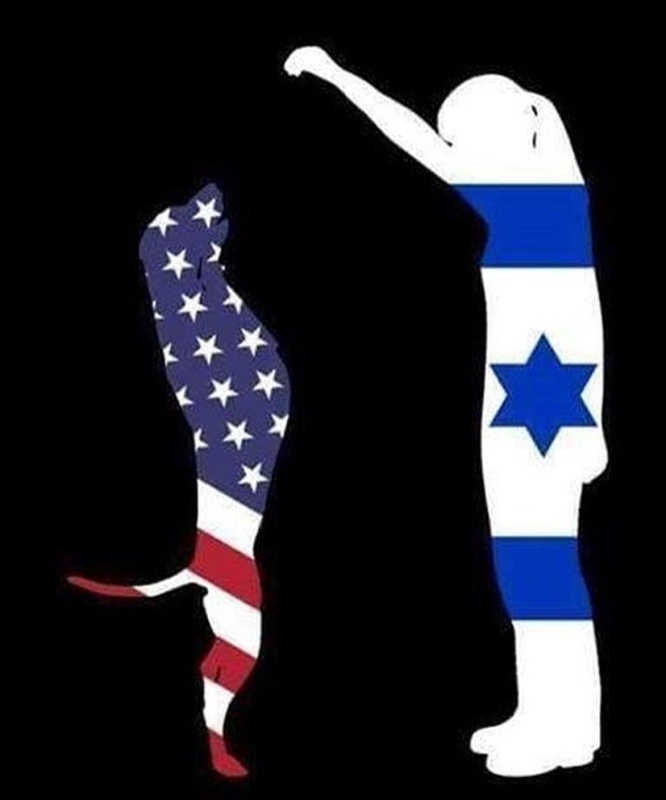 Excellent cartoon, Occams, that’s one of the best depictions of Israel’s utter control of the US; this evil, filthy Zionist Entity had the gall to direct the US to form a group to plot internal unrest against Iran. What we sorely need do is give them a direct NO and kick them out. Nothing new–we and Israel have been conspiring against Iran for some decades. What’s it going to be this time? Operation Clorox? Once again, we put on the blinders and refuse to pay attention to what happened last time we tried this in Iran. It took 26 years, but that blow back was never, ever in doubt.